MT is Macaroni Tubing; AMT is American Macaroni Tubing; AMMT is American Mining Macaroni Tubing. The connections are three (3) names given to the same basic threaded connection. AMMT Threads all have 6 threads per inch and a Taper per foot of 1‐1/2". The standard sizes range from 3/4 up to 2‐1/16". 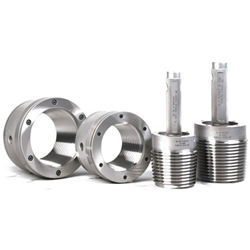 Thread Check, Inc. offers the complete range of AMMT Thread Plug and Ring Gages. Our engineering staff have served on various API gaging subcommittees and have worked in the energy industry for many decades. Thread Check's expert engineers can assist you with engineering and building custom gages. Thread Check is a proud member of the American Petroleum Institute.